"Slavery will not be in the past until the day when the lingering effects of slavery are recognized and justice is done. This is a profound time for white Americans. Will we pass on to our children a burden of unearned, undeserved privilege and wealth at the expense of others? Or will we pass on to them a legacy of justice and equality from which to gain strength and inspiration, and upon which to build a better world? The Black Reparations Movement is telling us that the time has come to choose." "The authors' reflections and questions represent the kind of soul-searching that each of us must do if we are ever to live and walk in truth in the USA, and the kind of soul searching and truth telling that the government must do if its good works and professed noble intentions are to be credible at home and in the international community. And [the authors] provide themselves with an opportunity to choose their own thoughts rather than the lies that we have all inherited from an era and a people who benefited royally from those lies. Perhaps their work may be able to show by example the healing properties of truth telling." Authors: Carol Chehade, Mark George, Dorothy Blake Fardan, Ida Hakim, Amy Kedron, Donna Lamb, Jerry Saltzman, Molly Secours, Larry Yates. Forward by Queen Mother Dorothy Lewis. "How much courage it takes for white Americans to organize themselves and pursue the issue of reparations for Black people. How dangerous is the undertaking and how noble are the participants." "This is a profound effort to restore long overdue justice. CURE's vision and dedication will open hearts and change minds." "The Debtors: Whites Respond to the Call for Black Reparations should be read by all white racial justice workers who see reparations as a peripheral issue in the struggle for racial justice. CURE's book shows how `forgiveness' without `atonement' (reparations) is simply empty rhetoric and hollow justice. The book is simply a must read for those who claim they understand the history of white supremacy and reparations." "The call for Reparations has long fallen on deaf ears, but it must be answered. When we are called to do what is right, we must heed. The White response to this call should be focused on creating an environment conducive to the Black community's efforts to repair itself." 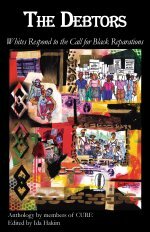 "The contributing authors of this book express a passionate and profound understanding of the relevance and importance of Black reparations. Their advocacy informs and inspires readers in ways that will enliven the debate over this timely issue. It also offers Whites, in particular, ways of finding a place in supporting Black reparations." "White Americans must go beyond liberal guilt and conservative denial and launch into progressive action in support of Black reparations. This compilation of white writers in support of reparations is a move in the right direction and a must-read for all white Americans in particular, but all Americans in general."